Barack Obama doesn’t care enough about American lives to help those in danger and left four brave Americans to die in Benghazi. That much is clear already. Timmerman’s book fills in the rest of the story. Wiktorowicz separated the Islamists into two main groups: those he called purists, or nonviolent Islamists, and the Jihadis. The purists included preachers such as al-Qaradawi, who championed dawa, proselytizing the faith. They also included political Islamist groups such as the Muslim Brotherhood. Wiktorowicz argued that the United States should invest in these allegedly nonviolent Islamists, in the hope that they could deter or marginalize their violent brethren, al Qaeda and its affiliates. Despite the inanities of Wiktorowicz’s arguments, he managed to install them into the doctrine and practice of the administration. This, combined with the insidious infiltration of the Muslim Brotherhood, explains how Obama could continue to funnel support (through the pro-jihadi government in Qatar) to the Libyan anti-Qaddafi National Transitional Council (TNC) even after the secular leaders within the TNC were sidelined or assassinated and replaced by a jihadi leadership. Abdelhakim Belhaj, a Libyan who traveled to Afghanistan to join with the Taliban to fight the Americans before he was captured and sent to Libya for interrogation and detention. He became head of the Tripoli Military Council after its secular leader, General Abdul Fatah Younis, was assassinated. Ahmed Abu Khattala, an Islamist who formed the terrorist group “Libyan Islamic Movement for Change”, which later merged with and became the backbone of Ansar al-Sharia, formed by a released Guantanamo detainee in 2010 “with funding and weapons from Iran and Qatar.” He became head of internal security in Benghazi. He is believed to be the man who assassinated General Younis, thus clearing the way for the Islamist takeover of the Libyan opposition. 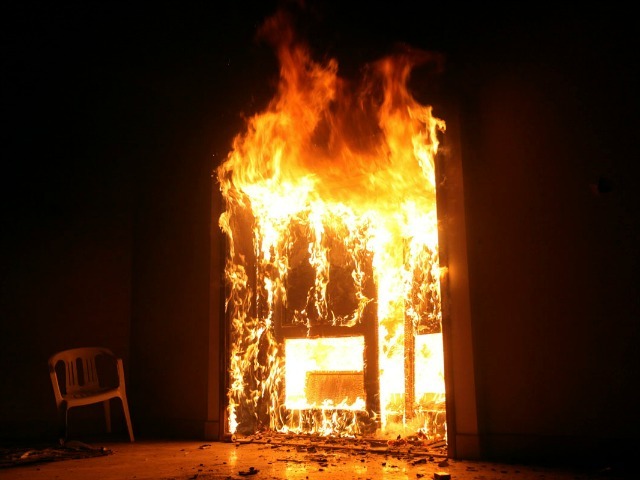 Timmerman’s case that the Iranian Quds Force was behind the attack in Benghazi comes from his sources within the Western intelligence community and former Iranian intelligence operatives who maintain contacts within the Iranian Government. Supporting their testimony are the hard facts that a) U.S. Intelligence had been following Iranian intelligence activity in Libya for months before the attack; b) Iran had been repeatedly caught red-handed smuggling weapons out of Libya (sometimes it was so brazen that the smuggling crates would bare Iranian military markings); and c) The attack in Benghazi followed the Iranian attack pattern to a T–especially the precision of the mortar strikes, a Quds Force specialty–easily recognizable to Iraq veterans. My sources say the head of the Iranian team in Benghazi was a senior Quds Force officer named Ibrahim Mohammed Joudaki. He had gotten his start killing Kurds in northwestern Iran, and later ended up in Lebanon where he trained Hezbollah fighters. His deputy, Khalil Harb, was someone he had known and worked with for years in Lebanon. Harb was a top Hezbollah operative and a deputy to Quds Force chieftain Qassem Suleymani. As an Arab, it was easier for him to interface directly with the local militias and handle the logistics of the operation itself. Over those first two months, Joudaki spread money around, while Harb and his team of hardened killers gathered intelligence, recruited militiamen, and refined the operational plan. My sources say Harb had a total of some 50 Quds Force operatives on the ground to manage the attacks. Timmerman goes into great detail into how the attack unfolded–including how the attempt to blame the Youtube video began even before the fighting had stopped, while Ty Woods and Glen Doherty were still alive fighting to protect their fellow Americans from the barbarians. It is likely that none of this would have happened if Obama had the courage to support the Iranian freedom struggle in the summer of 2009. But he didn’t. His disdain for freedom, lack of concern for human rights, cowardice in the face of evil and low moral character were on full display. This was proved and amplified by his actions on September 11, 2012. May Obama’s legacy always be haunted by Benghazi.